Do you fall asleep at the wheel? Your drowsy driving can be caused by a sleep breathing disorder. 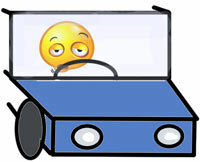 Driving drowsy is a very common problem in people with sleep apnea. In fact, it is so common that car accident is one of the most important cause of death in drivers with sleep apnea. You don't need to have a severe sleep apnea to sleep behind the wheel. A simple mild apnea disorder can make you feel sleepy enough to be a drowsy driver. Even if you stop the car and take a short nap, you'll still feel tired and sleepy. When you are on the road, sleep apnea affects your senses that you are using to drive safety. It will be difficult to focus your eyes, to remain alert and to react quickly at driving situations. You cannot find a better example of falling asleep while driving! You don't need to fall asleep while driving to have a car accident. A simple nod off or a long blink of an eye can make your car crossing into the next lane or crushing into a tree from the wayside. Maybe this is one of the reasons why drivers denies that they are sleepy on the wheel and dangerous to others. Another reason is pride, especially in men. They don't realize how subtle they are falling asleep behind the wheel. Sometimes a second of lack of attention is enough to have an accident. Sleep apnea patients have been shown to be as impaired in driving skills as are those with blood alcohol concentrations in excess of legal limits. These findings raise important issues for practitioners in deciding about driving safety. A majority of the United States lacks explicit laws stating that such apnea patients should be reported to the department of transportation. Texas, California, and all Canadian provinces require physicians to notify state motor vehicle authorities of patients diagnosed with sleep apnea. It is unclear if such a reporting system will have the desired effect of reducing crashes or whether it will discourage persons with sleep apnea from seeking treatment for fear of losing their drivers’ license. The ATS (American Thoracic Society) recommends that patients be reported to their state department of transportation only if they have been involved in a motor vehicle accident caused by falling asleep at the wheel or if they refused treatment for sleep apnea. Documentation of appropriate counseling to patient about the dangers of driving is also recommended. If you know you have an untreated sleep apnea you should not drive. You can continue to drive only after you are using an effective treatment prescribed by your doctor. You can avoid to be a sleepy driver if you use a CPAP machine every time you sleep, but remember: you only need one night of sleep without CPAP to have an excessive daytime sleepiness symptom and to be in danger on the road.